Hi! I’m River! I’m a 31-lb. 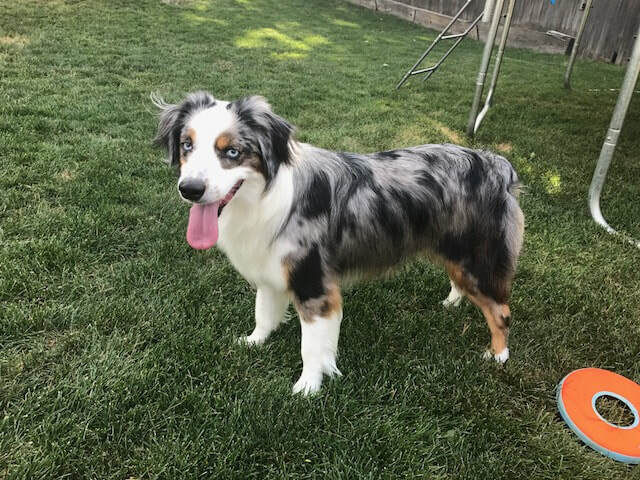 1-1/2-year-old mini Aussie Shepherd, and as you can see from my photo, I’m cute as a bug! I’ve been staying with my original person’s family members recently, and there are young kids around —- but I’ve been finding that just too stimulating for my sensitive nerves; and also, hey, I’m a herding breed so sometimes I think kids need to be herded. Because of this, they’re saying “no kids, please” in my forever home. My ideal new home would be a relatively quiet one, if you don't mind. I love people in small groups (especially quiet, chill people). I also love other dogs! So if you already have a dog that would be great as we could play and play. My people recently tried me out in an agility arena with a trainer and I did a great job of learning new stuff there -- so they're saying I'd make a terrific agility dog! I love hiking and running next to my person’s bike — in fact, that’s one of my favorite things to do! I’m extremely smart and ready to learn lots of fun new tricks! I’m crate-trained and housetrained, and I have a beautiful coat! Oh -- forgot to say I love my frisbee! I'm currently in the Lone Tree, Colorado area. For more info about me, go to the top toolbar, click Adopt, click Dog Application, fill it out and send it in. When you fill it out and email it in, be sure to add a cc to: <newfylove@yahoo.com> so that a volunteer at that email address will get back to you.